This is a guest post from my dear friend Freda, whom I have known since earliest childhood. She is awesome. In the Disney movie Ratatouille, the adorable rat Remy is guided by the spirit of Chef Gusteau who boldly tells him “Anyone can cook!” Well readers, I am here to tell you he was wrong. I cannot cook. I can, however, turn the perfectly wholesome idea of yummy chocolate chip cookies into a pipe-bomb-like disaster. It all started out very well intentioned. I placed six Hershey’s frozen break and bake cookies in a Pyrex dish and put them in the oven at 350 degrees for about 12 minutes. Once done, I placed the Pyrex dish on the stovetop to cool. At this point I thought to myself, what goes better with cookies on an unseasonably chilly night than a cup of hot tea? In my exhausted stupor, I put the kettle on the back burner, but turned on the front burner instead—the very same front burner that I had rested the Pyrex on. Shortly after, I heard what sounded like ten different dishes dropping on the floor. In reality, it was little bits and shards of cookie and glass shattering to bits, coating my kitchen in a dangerous kind of pixie dust. Oops. Did I mention the small kitchen fire? The entire mess took three days to clean. And I can’t even say how this has affected my relationship with chocolate chip cookies. Moral of the story? Not everyone can cook. Some people really do need adult supervision. And next time you want warm, gooey, fresh from the oven homemade cookies—go to the supermarket. 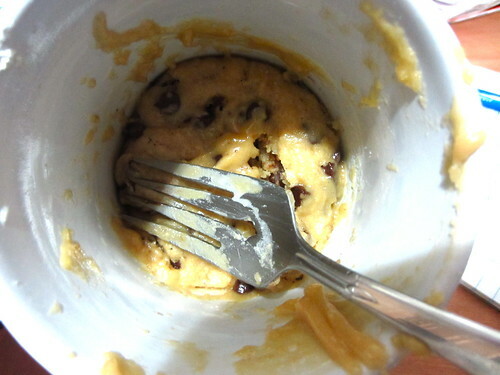 On an unrelated note (it’s me again), you should make some mug cookies. I made this a really long time ago and don’t even remember if it’s good. But it probably was.